Acknowledged author B. P. Lathi wrote Modern Digital and Analog Communication Systems (The Oxford Series in Electrical and Computer Engineering) comprising 1004 pages back in 2009. Textbook and etextbook are published under ISBN 0195331451 and 9780195331455. Since then Modern Digital and Analog Communication Systems (The Oxford Series in Electrical and Computer Engineering) textbook received total rating of 3.5 stars and was available to sell back to BooksRun online for the top buyback price of $34.71 or rent at the marketplace. 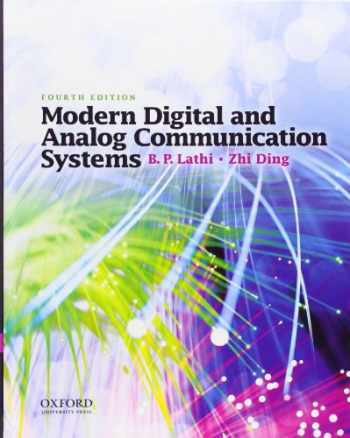 An ideal first text on communication systems in electrical engineering, Modern Digital and Analog Communication Systems is now in its fourth edition. Retaining the superb pedagogical style of the first three editions, the authors first introduce the fundamentals of signals and systems and core communication topics; they then present the tools essential to the design and analysis of digital communications. Featuring a seamless blend of mathematics and heuristics, carefully crafted examples to clarify mathematical abstractions, and new and updated MATLAB exercises, this text provides a thorough coverage of modern communication system theory and application that is easily accessible to students. Modern Digital and Analog Communication Systems is suitable for students with or without prior knowledge of probability theory. Only after laying a solid foundation in how communication systems work do the authors delve into analyses of communication systems that require probability theory and random processes. Revised, expanded, and updated throughout, the fourth edition reflects the many technological advances in the field, such as OFDM and CDMA, pervasive communication applications such as cellular systems, wireless LAN systems, and DSL modem technology services.Features * Flexible organization (outlined in the preface) that accommodates a variety of course structures, including one-semester, two-semester, one-quarter, and two-quarter* Accessible to students with no background in probability theory* Abundant real-world examples that are applicable to students' everyday lives* Gives intuitive insights--rather than just proofs--wherever possible, as well as heuristic explanations of theoretical resultsA solutions manual is available for adopting professors.